Ministers will be forced to publish the government's full legal advice on the deal after MPs found them in contempt of Parliament for issuing a summary. Theresa May said MPs had a duty to deliver on the 2016 Brexit vote and the deal on offer was an "honourable compromise". Addressing the Commons at the start of a five-day debate on her proposed agreement, Theresa May said Brexit divisions had become "corrosive" to UK politics and the public believed the issue had "gone on long enough" and must be resolved. MPs will decide whether to reject the terms of the UK's withdrawal and future relations with the EU on Tuesday 11 December. The Commons supported a motion demanding full disclosure of the government's legal advice, by 311 votes to 293. It came after Attorney General Geoffrey Cox published a summary of the advice on Monday and answered MPs questions for three hours - but said that full publication would not be in the national interest. Labour had accused ministers of "wilfully refusing to comply" with a binding Commons vote last month demanding they provided the attorney general's full and final advice. After Labour demanded the advice should be released ahead of next Tuesday's key vote on Theresa May's deal, Commons Speaker John Bercow said it was "unimaginable" this would not happen. Lib Dem leader Sir Vince Cable said the result left the government "on the ropes", adding: "Theresa May's majority has evaporated, and the credibility of her deal is evaporating with it." But Tory Dominic Grieve's motion means that instead of MPs being confined to merely taking note of what the government tells them, the Commons would be able to exert more influence by voting on what they wanted the government to do as well. 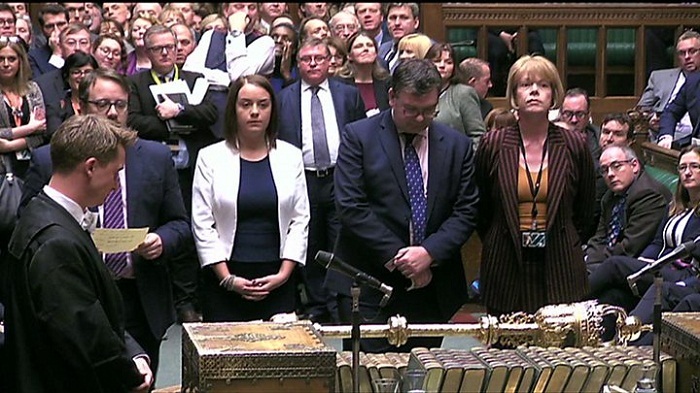 Tuesday's vote, in which 26 Tory MPs rebelled, could potentially tilt the balance of power between government and Parliament if, as expected, MPs push for a "Plan B" alternative to Theresa May's deal and also seek to prevent any chance of a no-deal exit. Mr Grieve, who has expressed support for another Brexit referendum, told Channel 4 News he was not seeking to "guarantee a particular outcome" if Theresa May's deal went down. As she sought the backing of the Commons for her Brexit deal, the prime minister said she was confident the UK would enjoy a "better future" outside the European Union. She said the "honourable compromise" on offer was "not the one-way street" many had portrayed it to be and that the EU had made it clear that the agreement would not be improved on. "I never said this deal was perfect, it was never going to be. That is the nature of a negotiation," she said. "We should not let the search for a perfect Brexit prevent a good Brexit... I promise you today that this is the very best deal for the British people and I ask you to back it in the best interest of our constituents and our country." But Labour leader Jeremy Corbyn said it was a bad deal for the UK and Labour would seek a vote of no confidence in Theresa May if she could not get it through Parliament. "This House will make its decision next Tuesday," he said. "I hope and expect this House will reject that deal. "At that point, the government has lost the confidence of the House. Either they have to get a better deal from the EU or give way to those who will." Ex-foreign secretary Boris Johnson dismissed the deal as a "paint and plaster pseudo-Brexit" and said its supporters would be "turning their backs" on the 17.4 million Leave voters. "If we try to cheat them now, as I fear we are, they will spot it and will never forgive us," he said.